The panelists will briefly discuss their science, their backgrounds, and how they made their connections across our community. In addition to the panelists, there will be a number of other JPL/Campus researchers who have successfully traversed this bridge and will be available for networking during the reception. 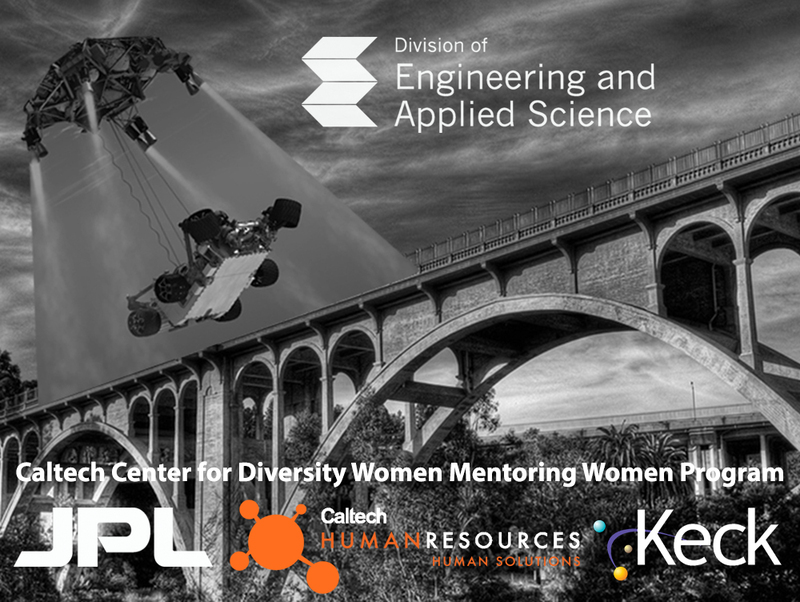 This event is sponsored by the Division of Engineering and Applied Science at Caltech, JPL, the Caltech Center for Diversity Women Mentoring Women Program, Caltech Human Resources and the Keck Institute for Space Studies. Dr. Morgan L. Cable joined the Instrument Systems section of JPL in 2013, but has been involved in joint Caltech-JPL activities since her first summer internship at JPL in 2004. During her graduate studies to earn her Ph.D. in Chemistry, she had two advisors: one at Caltech (Prof. Harry Gray) and one at JPL (Dr. Adrian Ponce). Strong ties with Caltech continued during Morgan's NASA Postdoctoral Program (NPP) fellowship at JPL, involving the development of ultrasensitive micro-total analysis systems for the detection of organics on Mars and Titan, a moon of Saturn, including participation in a KISS workshop on new technologies to study Titan. As the Cassini Assistant Project Science Systems Engineer, Morgan’s work continues to focus on organic and biomarker detection strategies, through both in situ and remote sensing techniques. She also continues to leverage her connections with Caltech to pursue synergistic collaborations with JPL. Dr. Stephanie Leifer joined JPL in 1989 to work in advanced propulsion technology with a B.A. in Math and Physics from the University of Pennsylvania. In the course of her work, she identified a novel concept to use C60 molecules as the propellant in electric thrusters, and made this the topic of her PhD research during her graduate studies in Applied Physics at Caltech. After graduating from Caltech, Dr. Leifer went to work at Hewlett Packard, where she gained experience in microfabrication techniques. In 1998, she returned to JPL to manage the Advanced Propulsion Concepts activity. Since that time, Dr. Leifer has been involved in a wide variety of technology areas at JPL, including systems engineering for the Space Interferometry Mission (SIM), mission studies focusing on radioisotope power systems, and development of high voltage solar arrays for electric propulsion. Dr. Leifer is currently working on a joint JPL-Caltech project supported by the Caltech/JPL President's and Director’s Fund to develop a capability for high precision radial velocity detection of exoplanets through the use of frequency combs. The growth of interest in frequency combs at JPL and Caltech led to a recent KISS workshop she co-led earlier this month on optical frequency comb technology for space applications. Dr. Julia Greer is Professor of Materials Science and Mechanics at Caltech and focuses on nano-scale phenomena: mechanical properties, in-situ deformation, and nano-fabrication. She and her research group have shown that metallic glasses have an atomic-level structure although it differs from the periodic lattices that characterize crystalline metals, showing that atoms are only arranged fractally up to a certain scale, beyond which clusters of atoms are packed randomly and tightly, making a fully dense material, just like a regular metal. Professor Greer’s work on nanolattices is part of the 2015 MIT Technology Review’s 10 Breakthrough Technologies List. Her work was selected specifically for “materials whose structures can be precisely tailored so they are strong yet flexible and extremely light.” Prof. Greer has been named a Young Global Leader by the World Economic Forum and has been awarded the Kavli Early Career Lecture in Nanoscience, both in 2014. Dr. Fiona Harrison is the Benjamin M. Rosen Professor of Physics and Astronomy at Caltech, and is currently the PMA Division chair. Her research is in observational and experimental high energy astrophysics. Prof. Harrison is the Principal Investigator for the NASA's Nuclear Spectroscopic Telescope Array (NuSTAR) Explorer Mission, which was developed in partnership with JPL and launched in 2012. She also use X-ray telescopes like Chandra, XMM, and Suzaku, as well as ground based optical telescopes such as those at the Palomar and Keck Observatories to understand black holes, neutron stars, and supernova remnants. Prof. Harrison’s labs at Caltech are developing state of the art high energy X-ray detectors and instrumentation for future space missions. She is a member of the National Academy of Sciences, and has been awarded the 2015 Bruno Rossi Prize from the High Energy Astrophysics Division of the American Astronomical Society.